The Pythagoras Cup (Pythagorean Cup) is the name given to a drinking cup attributed to the ancient Greek philosopher, Pythagoras of Samos. This cup is also known as the Greedy Cup and the Tantalus Cup. Can you guess why? 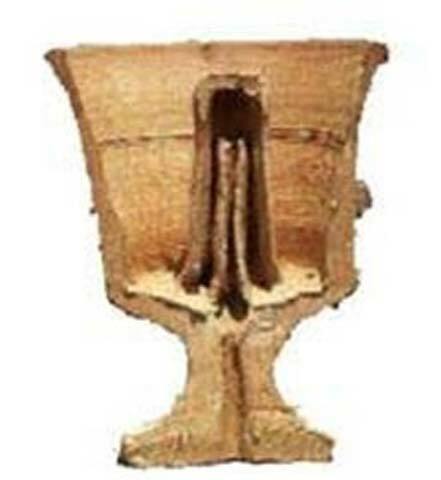 Whilst the Pythagoras Cup looks like any ordinary drinking cup, it is in fact an ingenious device that would empty itself when it is filled to a certain level with liquid. Some have called the Pythagorean Cup a clever practical joke, but others are of the opinion that it was a handy device that was used to teach the virtue of moderation and to caution against the vice of greed. The Pythagorean Cup is alleged to have been invented by Pythagoras of Samos. According to one popular tale, the Greek philosopher was supervising a group of workers at the water supply works on Samos. In order to ensure that his workers were not drinking too much wine, Pythagoras invented the Pythagorean Cup. Provided that the workers filled their cups only up to the designated level, they could have their drinks. If, however, they decided to fill the cup beyond this level, the wine would ‘miraculously’ drain itself out of the cup. According to another story, the Pythagoras Cup was created to teach the value of temperance to Pythagoras’ followers, and to discourage them from being greedy. What Does Tantalus Have to Do with It? Incidentally, the Pythagorean Cup is known also as the Tantalus Cup. This does not mean that Tantalus is also a claimant to the invention of this cup. Instead, the association between the Pythagorean Cup and Tantalus is a more sinister one. Those familiar with Greek mythology would recognize that Tantalus was a legendary king of Sipylus in Lydia (or sometimes Phrygia). The ancient Greeks believed that Tantalus was the son of either Zeus or Tmolus (a king of Lydia) and the nymph Plouto. Tantalus is best-known, however, for being punished eternally in Tartarus, the deep part of the Underworld that was reserved as the prison of the Titans and for the punishment of evildoers. There are several myths explaining the reason for Tantalus’ punishment in Tartarus. 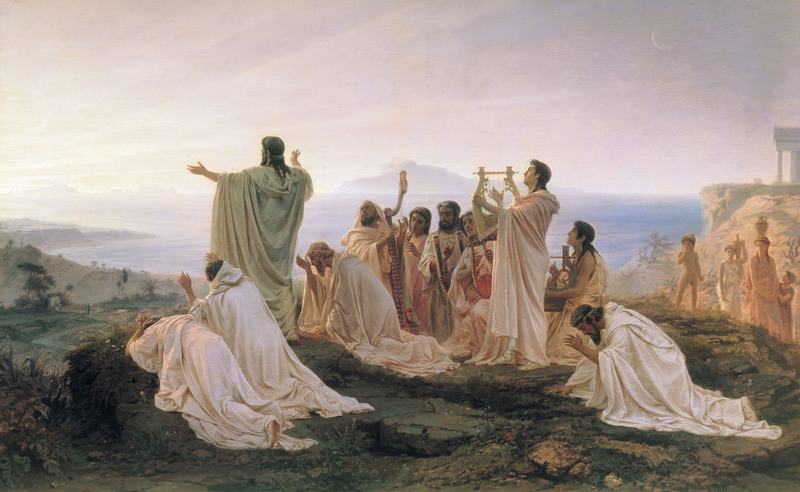 The most famous one states that the king had invited the Olympian gods to a banquet. According to one version of the story, Tantalus decided to test the gods’ power of observation. Therefore, he killed his son, Pelops, boiled him, and served him to his immortal guests. As expected, the gods knew what Tantalus had done, and refused to eat. Only Demeter, who was distraught at the loss of her daughter, Persephone, was not aware of the gruesome deed, and ate the shoulder of Pelops. Zeus decided to restore Pelops to life, and an ivory shoulder was given to him to replace the one consumed by Demeter. For this heinous act, Tantalus was severely punished. Zeus had him killed by crushing him on a mountain, and then destroyed everything he had created. In the Underworld, Tantalus was brought to Tartarus, where he was thrown into a lake with a fruit tree just above him. He was to suffer eternal thirst and hunger, as he was neither able to reach the fruit above, nor the water below. As the king tried to take a bite of the fruit or a gulp of water, these would move away from him. It is due to his inability to quench his thirst or satiate his hunger in the Underworld that Tantalus’ name has been loaned to the Pythagorean Cup as well. How Does the Pythagoras Cup Work? Returning to the Pythagoras Cup, this drinking vessel takes advantage of a natural phenomenon known as the siphon. In the center of the cup is a hollow upside down u-shaped pipe, one end of which opens at the base of the cup, and the other inside the cup. If the cup is overfilled, the liquid within will begin to flow out of the cup through the curved tube. This causes the pressure in the upper part of the pipe to be reduced, thus allowing the higher atmospheric pressure to push the rest of the liquid out via the base of the cup. Whilst an actual ancient Greek Pythagorean Cups has yet to be found, a Roman one was discovered in Croatia in 2012. This is a bowl made of silver with a figure of Tantalus seated on a rock (the pipe is hidden in this rock) in it. 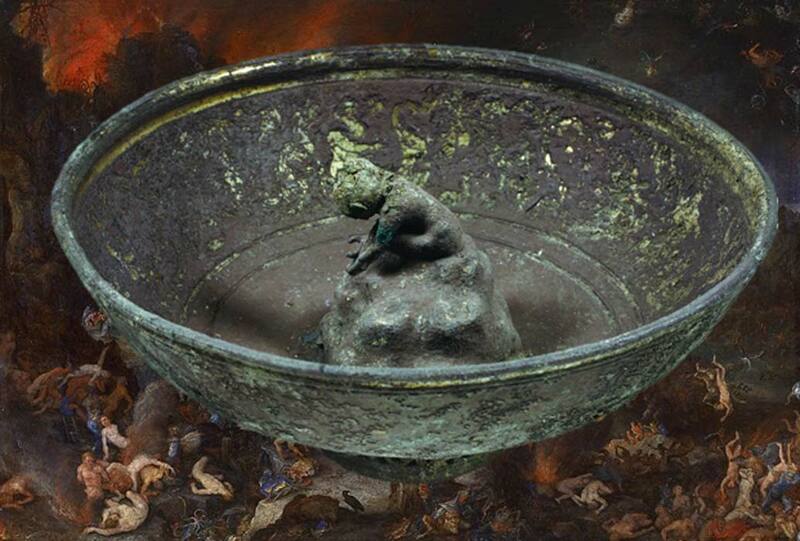 This bowl has often been regarded to be ‘the world’s first practical joke’. This is known in India as Lord Krishnas' Bowl, said to have been in use for thousands of years. Which culture "discovered" this first?